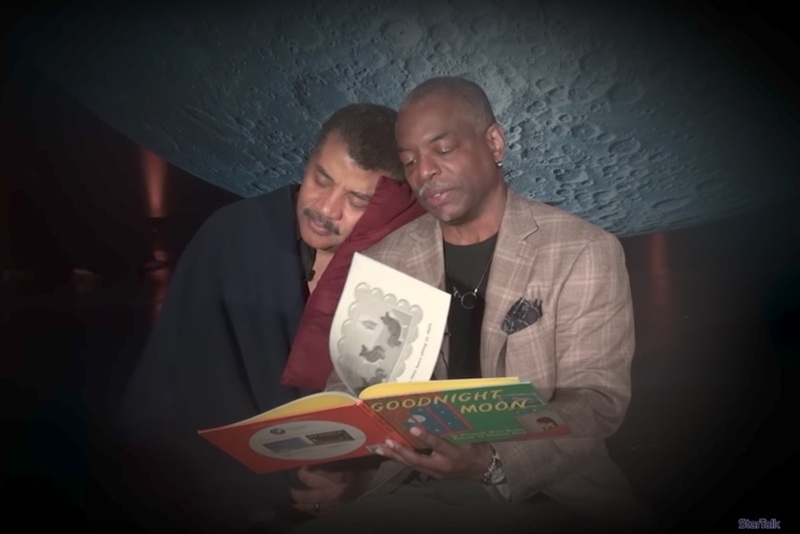 Watch Levar Burton read Goodnight Moon to Neil Degrasse Tyson! We love Levar Burton. Did you ever listen to our podcast interview with him? He’s the best! We love Neil Degrasse Tyson. He’s not yet a podcast guest, but we’re still hoping, because he’s also the best! One thing we’re torn on though…Goodnight Moon. Yes, it’s the most popular baby shower book gift since…ever, which is why every parent owns 47 copies. (They multiply like Tribbles, those things.) But that old lady whispering hush always freaked me out. A lot. Behold: Levar Burton reading Goodnight Moon to Neil Degrasse Tyson at NY ComicCon this week. Complete with Neil cuddling up with a little stuffed friend. Aaaand now we all have to step up our own bedtime story reading game. It was part of a bit from the brilliant folks at Audible, to support The Martian author Andy Weir’s upcoming book Artemis. But…whatever. LEVAR BURTON IS READING GOODNIGHT MOON TO NEIL DEGRASSE TYSON! That old lady never sounded quite so lovely. I may have just listened to this twice in a row at work…Levar’s voice is so soothing!